Italy has recently threatened to close its ports to foreign ships in an effort to force the EU to react. 52 migrants, among them a woman and two boys, huddle on shore after being rescued by the Spanish Maritime last month. THE SOARING DEATH toll and abuses faced by thousands of refugees and migrants in Libyan detention centres are “clearly linked to failing EU policies”, Amnesty International has said in a report published today. 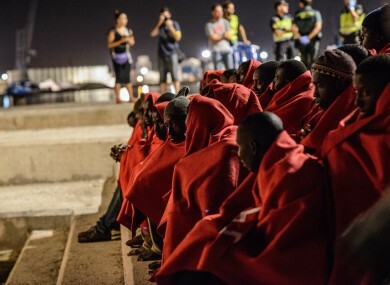 The not-for-profit groups report, A perfect storm: The failure of European policies in the Central Mediterranean, finds that by giving most of the responsibility for search and rescue operations to NGOs. Last week, Italy threatened to close its ports to foreign ships in an attempt to encourage the EU to react to the migrant crisis. Italy and Greece, two member states that are already struggling financially, are taking the bulk of the burden. Since 2014, the Italian coast guard has coordinated the rescue of over 590,000 migrants, while over 14,000 have died or are feared drowned. “We are facing a tragedy of incredible dimensions… (but) the solution is not at sea,” Italian coast guard head Vincenzo Melone said. “European states have progressively turned their backs on a search and rescue strategy that was reducing mortality at sea in favour of one that has seen thousands drown and left desperate men, women and children trapped in Libya, exposed to horrific abuses,” said John Dalhuisen, Amnesty International’s Europe Director. One Nigerian man stranded with 140 others on a boat that was taking on water for nine hours told Amnesty International. All of us were praying. When I saw the lights [of the rescue boat] I thought: please, please, not the Libyan police. A Bangladeshi man told Amnesty International what happened after he had been picked up by the Libyan coastguard. Dalhuisen is worried that the situation is only going to get worse if something doesn’t change. “The EU must rethink its cooperation with Libya’s woefully dysfunctional coastguard and deploy more vessels where they are desperately needed,” he said. - With reporting from AFP. Email “Deaths and abuse of migrants 'clearly linked' to EU policies, says Amnesty”. Feedback on “Deaths and abuse of migrants 'clearly linked' to EU policies, says Amnesty”.